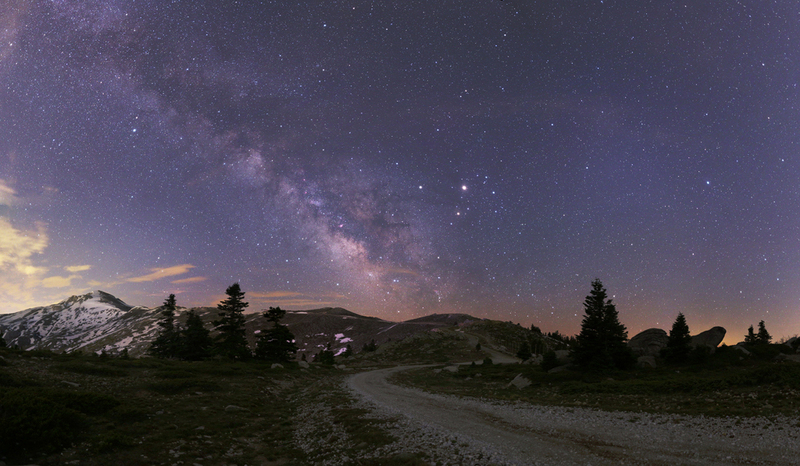 Explanation: In this early May night skyscape, a mountain road near Bursa, Turkey seems to lead toward bright planets Mars and Saturn and the centre of our Milky Way Galaxy, a direction nearly opposite the Sun in planet Earth's sky. The brightest celestial beacon on the scene, Mars, reaches its opposition tonight and Saturn in early June. Both will remain nearly opposite the Sun, up all night and close to Earth for the coming weeks, so the time is right for good telescopic viewing. Mars and Saturn form the tight celestial triangle with red giant star Antares just right of the Milky Way's central bulge. But tonight the Moon is also at opposition. Easy to see near bright Mars and Saturn, the Full Moon's light will wash out the central Milky Way's fainter starlight though, even in dark mountain skies.